Have you ever come home from a party and your child is bouncing off the walls, sick and irritable? It’s more than likely all the additives and the sugar-high from ‘traditional’ party foods. My conscience just won’t let me serve that stuff up to kids anymore. There are so many yummy, healthy things you can make instead. Sure have a treat or two in there if you like, but balance it out with loads of the good stuff. Okay, so here is my tried and true formula for catering a healthy kid’s party. KISS – Keep it Simple Sweetheart. Remember my last post. I serve four different types of food, plus the cake. I put them onto eight smallish serving plates, so it looks impressive. I do a fruit, a vegetable, a savoury and a sweet, plus the cake. ♥ Passionfruit cups. From Rebecca Mugridge’s new book Happy, Healthy Mums. This is a sneak peek, the book isn’t out yet! Sign up to Bek’s blog to stay updated. All you do is scoop the flesh out of the passionfruit, make a fruit salad, add the passionfruit back in and serve it with some toothpicks. All compostable! ♥ Fruit skewers like these by Hayley at Doing it for the Kids. 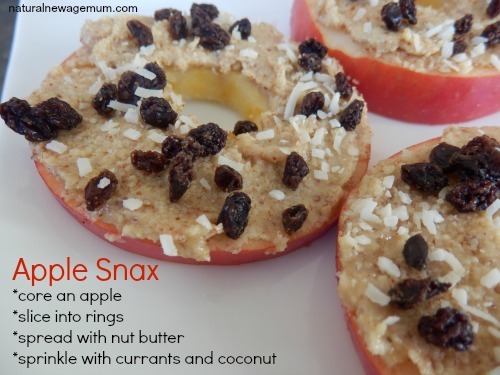 ♥ Apple Snax. Use some lemon juice to stop the apple browning, top with homemade nut butter and some yummy toppings. You could even make it a fun party activity and let the kids make their own. 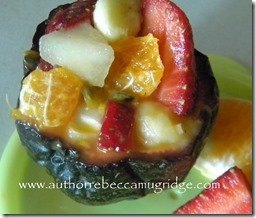 ♥ Or just do a simple fruit platter like the one pictured up the top. Fruit in season is cheap and delicious! ♥ I am deadly serious. Serve up some cherry tomatoes, baby qukes, baby carrots, snow peas and strips of capsicum with my yummy dip. Serve the dip in half a capsicum for a bit of fun. ♥ Kale chips. You can try! ♥ Zucchini slice. Serve it cut into squares with half a cherry tomato on top. ♥ Vegie Smuggler’s amazing Cheese Puffs. My kids love these and we have been making them with lots of different vegetables like carrot and broccoli. Yum. ♥ Chicken drumsticks or wings, baked with a sticky organic tamari and honey glaze. Sprinkle with sesame seeds and chopped spring onion. ♥ Chicken nuggets. No, not the ones from a packet! Try some of my homemade, super healthy recipes. 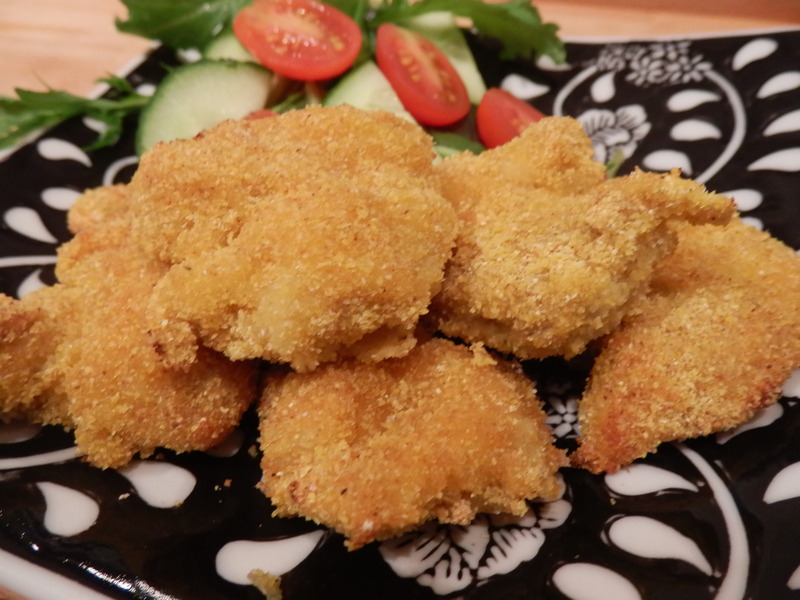 Serve with some easy home-made tomato sauce. ♥ Salad wraps. Choose a good quality wrap like Sorj or Mountain bread, add some boiled egg, organic chicken or organic ham, loads of salad, roll up and slice into small rounds. They looks so pretty. ♥ Popcorn. 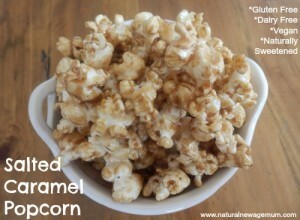 Buy the organic variety and pop it yourself in a popcorn machine or in a pan with a little coconut oil. Top with a healthy salt or some Vital Veggie Power. Do not buy the microwave popcorn – it’s horrid stuff. ♥ Sushi and rice paper rolls. You can buy these if you choose carefully! ♥ Kids love meatballs! Try my lamb meatballs or make some chicken or beef ones with loads of vegetables. Bake in the oven to make it quicker. 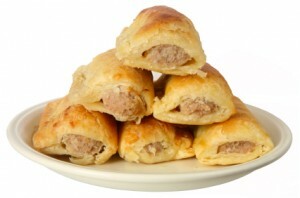 ♥ Cyndi O’Meara’s healthy, vegetarian sausage rolls have pretty much gained legend status. The kids will never know they are healthy. If you haven’t tried them, you must! Get the recipe. 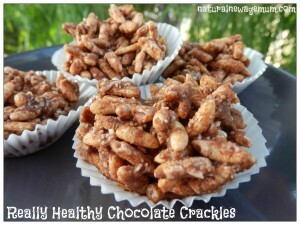 ♥ Really Healthy Chocolate Crackles. 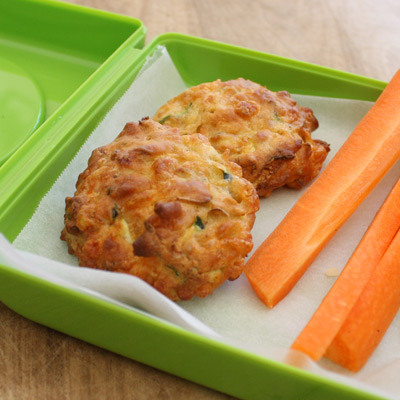 ♥ Carrot, Pineapple and Zucchini Muffins. ♥ Thermomix Sorbet. If you are lucky enough to have thermomix, fresh fruit sorbet is pretty darn impressive. Use honey or rapadura sugar. We talked cake the other day. Check out my six healthy birthday cake recipes here. 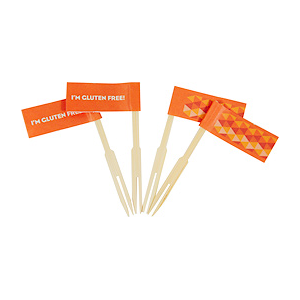 ♥ If you have children with any allergy issues, check out this range of cute flags and cupcake wrappers from Happy Tummies to mark your goodies with. ♥ Too busy too cook? Add in a few healthy packet snacks. Check out this post to find the best. ♥ You can easily make many of these ideas ahead of time and freeze. Okay, who’s still with me? Let’s talk drinks. ♥ Water. Get a huge container of water and ice and jazz it up. 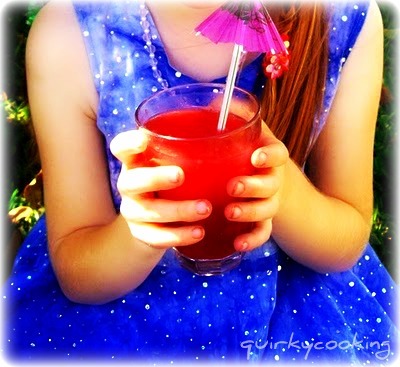 ♥ Raspberry Lemonade from Jo at Quirky Cooking. Super healthy and easy to make. Doesn’t it look the bomb! ♥ Make freshly squeezed juice, smoothies or milkshakes. Set up your juicer/blender/thermomix on a table and you can make them to order like a juice bar! 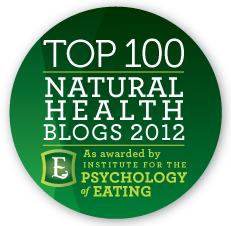 ♥ Alisha from Naughty Naturopath Mum has little kids and she uses plain Cocobella coconut water in poppers at her parties. She also told me to google this crazy idea. 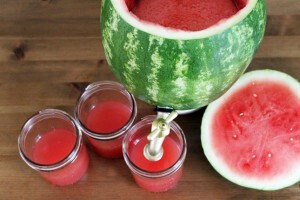 ♥ Make a watermelon your drink dispenser! 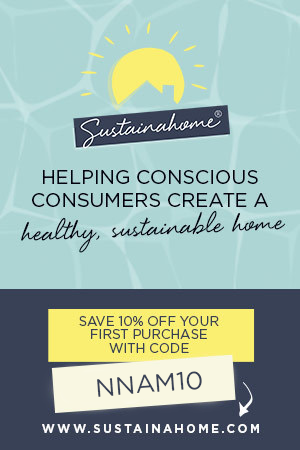 See how to do it at Brit + Co. 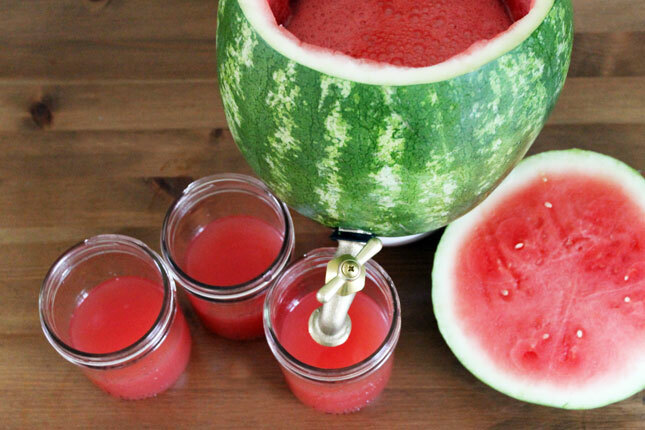 Fill it with a healthy watermelon drink and just watch the kids go nuts for it! I could go on, but I won’t! I hope this has given you some things to think about and try for your next kid’s party. I will leave you with some awesome blog posts about healthy parties from Mamacino and The Wholefood Mama. 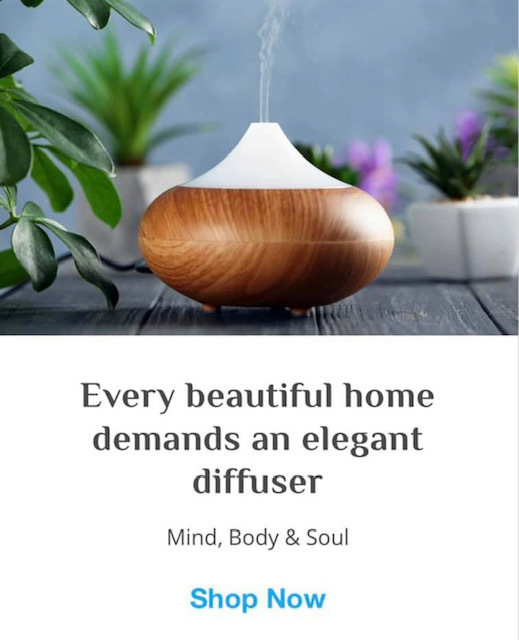 As always, I would so love to hear your ideas. 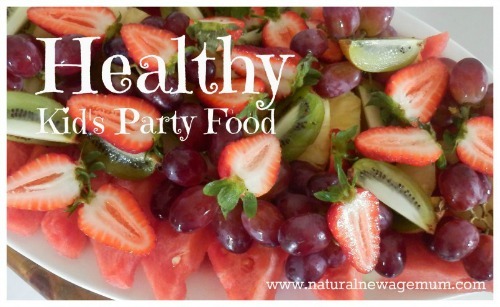 Add a link or let me know your fabulous tips for healthy party food! 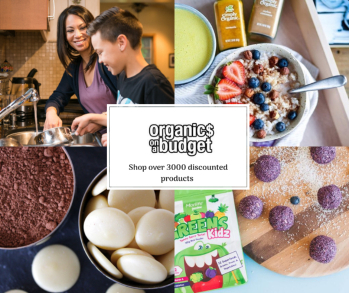 Click here to visit my Nutra Organics affiliate shop! Brilliant ideas. What about frozen bananas on a stick. Delicious as they are but perhaps coated with melted organic chocolate as an extra treat! I want to host a party just to try out some of these ideas! Great topic! I just hosted a raw food and whole food party for my two year old and we had lots of yummy things on the menu. All were dairy, processed sugar and wheat free. Watermelon spritzer, peaches filled with fresh coconut cream, freshly squeezed fruit ice blocks, inca berry and chocolate balls, salted caramel dip with green apples, blueberry jelly in oranges (made from agar agar), and vanilla and raspberry raw cheesecake which the kids loved! I’m in the process of writing an e-book relating to this topic. I’m with Kristin! Can we have a party without the kids with these foods and drinks?? I might be found spiking the watermelon with champers though…. I like the way you think, Alisha – I’m in! Hi, love this. As a mum who does home made birthday parties, in a healthy way, love it. Was just curious because it has thrown me for a six. I partially saw a TV show with Jo Frost, aka super mum, arguing that parents were putting their childrens hyper party behaviour down to sugar (i will also add the word crap) from party food and not just from excitment. They did some test (i didn’t sit and watch just saw bits and peices) had one group eat crap the other group eat fruit etc, then got parents to judge “sugar highs”. Naturally, the fruit parents all said their children were high and then (this bit I did watch cause I was gobsmacked) they concluded the behaviour from both groups was just excitment, sugar did nothing to them, and was ok to have. Parents needed to calm down about it all. I’m still reeling and can’t believe it was said. Did you see it? I think the show is called extreme parenting. Just curious as i am still annoyed about it. The message it was sending. Thanks for sharing my passionfruit cups!! Just love this post and that spinach dip looks so YUM! How cool is that watermelon drink fountain. Thanks Bek -you’re passionfruit cups are so cute! I love the idea of a dinosaur party, for some reason I don’t think we ever did that one! I did a dinosaur party and all the catering (naturopath/chef) a couple of years ago. I made a mudcake volcano with orange icing for lava; “meateors” meatballs, crocodilian biscuits (gingerbread), “swamp juice” green lemonade with bicarb, dinosaur biscuits I can’t remember what else; I think some sort of dip and vegies – all food was labelled with dinosaur themes and that was the bomb – all the parents got really excited about the food labelling and that got the kids eating because the kids were all laughing and shouting about the meateors or whatever. What fabulous party ideas!! 🙂 Thanks for sharing them! Hi Kim – I love sharing the ideas from my favourite pages! There are some clever mums out there. My kids are nearly 12 and 14 and yes, kids of any ages. You probably don’t need to make it as cutesy anymore though! – Banana ice cream – make it by putting frozen sliced banana into the food processor. It takes a while, but works. You can add berries, peanut butter, cocoa or if you want to allow a little sugar some chocolate chips (I know it goes against your theme, but it doesn’t need many and is a tasty combo… and the kids love it if you call it monkey poo ice cream). – Corn fritters – http://allrecipes.com.au/recipe/8594/nz-corn-fritters.aspx, you can add grated zucchini or kumera. Use a non stick pan and very little oil is needed for cooking. 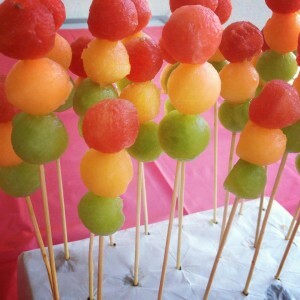 – Grape caterpillars – green grapes on a skewer and a couple of dots of icing for eyes. – Sandwich sushi or shapes – take their favorite sandwich and cut in shapes like stars or butterflies, or roll them up like sushi. I have been on a research mission this week for my son’s party, and your list was by far the best. Ready to feed an army of kids healthily! Some fantastic treats on this page, I will definitely be trying out the apple doughnuts this christmas as well as the chocolate crackles. Thank you for the inspiration. I loved the veggie tips, which is by far the most challenging food group to get children to eat at parties. Dips are the key to making vegetables tasty and fun to eat. I also like the idea of keeping the treats in small portions, especially the sweets. Great photos!